With the price of college going up every single year at an astounding rate, its obviously becoming harder to afford. One way to make it at least a little easier are to get scholarships, but the problem is that there's no good way to know which ones are out there, and which you are qualified for. That is where ScholarshipOwl comes in. It is a free online membership service that connects students with scholarships for college and graduate school, simplifying and automating the application process. It matches students to hundreds of scholarships. The company is launching on Wednesday after operating in a closed beta status for the past few months, during which it attracted more than 25,000 members. "Every year, about 22 million students head to U.S. colleges and universities, spending an average $30,000 each on their undergraduate or graduate education. At the same time, more than 3.5 million scholarships are looking for qualified candidates for funding support," Kenny Sandorffy, ScholarshipOwl founder and head of marketing and optimization, told me. "Too often, however, those scholarships get few or no applicants, because worthy candidates don’t know about them. Online scholarship directories help a bit, but merely provide a list of possible scholarships. They do nothing to simplify, automate or empower what is a time-consuming, tedious process for harried students and their families." Accessing the service requires a two-minute signup process involving basic information turns a visitor into a member, and generates the first batch of scholarship matches. More information provides more matches, which can be scanned quickly so a member can pick the highest priorities. If additional information such as an essay is needed, a window details what’s needed, and makes it easy to add. Even after the first applications go out, ScholarshipOwl continues to monitor its database for more matches, notifying members of approaching deadlines, new opportunities and more, throughout their college experience, as long as they remain members. Potential users for the company include high school students preparing for college, parents of those high school students, undergraduate and graduate students at all post-secondary institutions, high-school counselors and advisers, standardized testing consultants/providers, college admissions officers and outside admissions advisers. It can alsoo be used foundations, non-profit groups, corporations and others providing scholarships, as well as potential marketing partners, such as home-furnishing companies, testing companies and more. "No other site does what ScholarshipOwl does. It is the only site that not only finds potential scholarship matches but then automates and simplifies the tedious, time-consuming process of applying for them. It provides a wealth of other services to members, then continues to help by spotting new and recurring opportunities for more scholarship aid as long as the student is a member," Sandorffy said. Even in closed beta, the company was already seeing high return on investment for its users: students were matched up to between 60 and 70 scholarships they qualified for, often as high as 120. "We’re not in this simply for a return on investment, we want to do some good in the world and help democratize access to education for all." ScholarshipOwl was founded in October 2014. Its U.S. operations are based in Santa Monica, California. The company is based in Malta and is backed by a single private investor who "shares the company founder’s passions for helping students find and win as much scholarship aid as possible for their educations." “I first came up with the idea for the site out of my own experiences applying for scholarships while getting ready to go to college," Sandorffy told me. ScholarshipOwl's goal is to be synonymous with college scholarship aid. 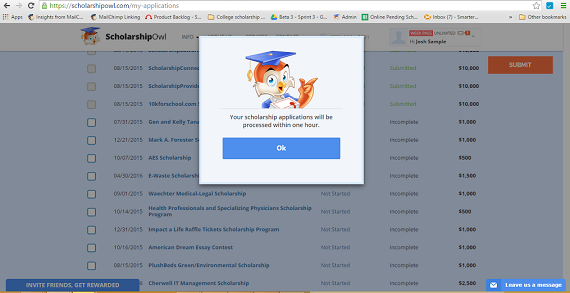 "If you plan to or ever dream of going to college, ScholarshipOwl will help guide you there." ScholarshipOwl is an innovative platform designed to dramatically speed up the scholarship application time. All users have to do is fill out one application, and we will do the rest. We'll match users with award opportunities that best match their personality, grades, lifestyle, and more. We will take the information from the initial application and put it into the appropriate places on the scholarships of choice, applying the user automatically.